I’m Diane Alberts (also known as Jen McLaughlin) and I had a new book come out this week called An Accidental Date with a Billionaire. It’s the first in a new series of standalone books, and in case you didn’t guess it by the title, the heroine accidentally bids on the wrong bachelor after promising her best friend that she will “save” her brother from being bought by a woman he doesn’t know. The problem is, Sam has never actually met her best friend’s brother, and instead of saving him she accidentally ends up with a very expensive date with Taylor (our hot, wealthy hero). In keeping with my ridiculously handsome and wealthy hero, I’m going to talk about something I’m shipping so hard right now—Lucifer and Chloe Decker on Lucifer. …and so incredibly complex and charming. My heroine in An Accidental Date with a Billionaire is totally shipping Jamie and Clair on Outlander right now because, I mean, how could she not? And I ship Sam and Taylor from An Accidental Date with a Billionaire because they bring out the best in one another, even in ways that they didn’t realize they had or needed. 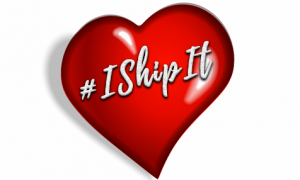 What’s not to ship about that? Check out Diane’s newest release An Accidental Date with a Billionaire, out now!